Casco Bay Island Transit District (Casco Bay Lines) is currently in the process of updating a portion of its existing fleet of vessels. Casco Bay Lines maintains a Transit Asset Management Plan to track the inventory of transit assets (including vessels), their condition and costs associated with their maintenance. This is common practice for any business seeking to plan and budget for the inevitable depreciation and increased maintenance costs of their assets. Typically, Casco Bay Lines passenger vessels have a “useful life” of approximately 30 years. While they can still be utilized safely beyond that point, repairs and maintenance become prohibitively expensive. The Casco Bay Lines Transit Asset Management Plan identified that the Machigonne II is beyond useful life and the Maquoit is approaching the same status. 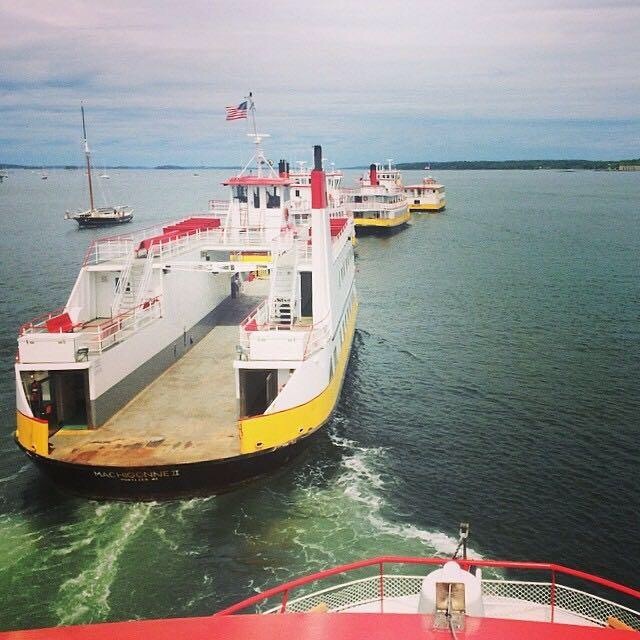 As part of a long-range planning process undertaken by the Casco Bay Lines Board of Directors (Board) between 2015 and 2016, the Board agreed to a number of goals and priorities, one of which was to secure funding for the design and construction of a new ferry. With the support of the Federal Transit Administration, the State of Maine, the City of Portland and the Portland Area Comprehensive Transportation System (PACTS), Casco Bay Lines has, as of February 2019, secured sufficient funds to design and construct one new vessel. Based on demand and facility constraints, the Maine Public Utilities Commission currently allows for Casco Bay Lines to utilize a fleet of no more than five vessels, four for regular operations and one spare. To help determine which of the current vessels should be replaced with a new vessel, and to assist with the Schedule Analysis Project, Casco Bay Lines issued a Request for Proposals (RFP) for a qualified consulting firm to evaluate the current fleet and schedule and make recommendations to the Board. This process, referred to as the Schedule/Fleet Analysis, included historical data analysis, a survey of all users of the ferry system, an open house at the Casco Bay Lines terminal, and public meetings on each island. Public feedback and data collected was utilized by the consulting firm to assist in their evaluation. Following a presentation from the consulting firm with their recommendation of which vessel should be replaced first, at the public Board meeting on May 17, 2018, the Board voted to use existing funds for a new vessel for Peaks Island service and to move forward in seeking additional funding for a new Down Bay Islands’ vessel. Casco Bay Lines had developed an RFP to select a vessel designer, inviting over eleven firms to consider submitting a proposal, and advertising the RFP. Four firms submitted proposals, two were short listed for interviews and Elliott Bay Design Group (EBDG) from Seattle, Washington, was selected. Casco Bay Lines entered into a contract with EBDG in May of 2018 and they began the work of assessing the vessel requirements using results from the fleet analysis work done by KPFF. Casco Bay Lines invited members of the Board and the public to join a vessel advisory committee and conducted a public kick-off meeting with the committee and EBDG on May 22, 2018. Since then, EBDG has been working to determine possible vessel configurations that meet the needs of Casco Bay Lines and conform to the various regulatory requirements and operational constraints. A second advisory committee meeting was held in October 2018 for EBDG to share progress and seek additional input. As of March 2019, the vessel design process is approximately 20% complete and EBDG is compiling their recommendation with the evaluation of various hull configurations and propulsion systems. Following completion of this analysis, they will deliver their comprehensive recommendations, including size, capacity, hull shape and propulsion, to CBITD. CBITD will then present it to the public at a public meeting on Peaks. EBDG’s recommendations, along with public comments from this meeting, will be presented to the vessel advisory committee and then the Board, for their consideration. Should the Board agree with the proposed design, the design phase will be complete and construction will begin. An informational public meeting was held on March 23, 2019, to discuss capacity for the new vessel currently being designed for Peaks Island service. Representatives from Casco Bay Lines presented an update on the current status of the Fleet Evaluation Project and the new vessel design. The public had an opportunity to provide feedback and ask questions at this meeting. A copy of the presentation can be found here and an audio recording of the meeting can be found here*. Answers to questions posed at the meeting will be posted on the website within a reasonable time frame. The design process for the new vessel remains in the initial stages. Casco Bay Lines strongly encourages public participation at all stages. In addition to the March 23rd public meeting, and previous public meetings for the Fleet Evaluation Project, there will be future opportunities for public input prior to the Board’s consideration of a proposed vessel design. Date, time and location of future public meetings will be posted on our website as well as shared via email to subscribers of our email newsletter list. * This audio recording was taken on March 23, 2019, at the public meeting of the Casco Bay Island Transit District held on Peaks Island at the Peaks Island Elementary School. The recording covers the entirety of the meeting beginning approximately at 10:00 am and concluding at approximately 12:30 pm.